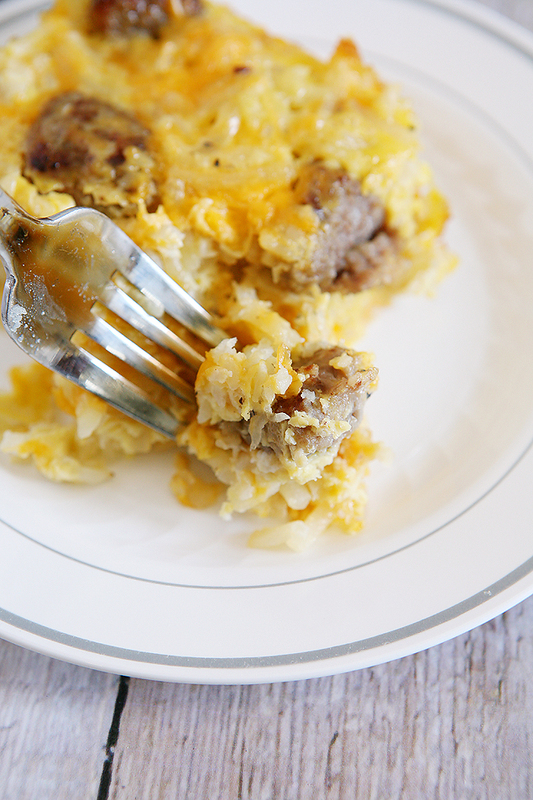 We are so excited to be partnering with Smithfield to bring you a yummy breakfast recipe today. If you purchase a Smithfield breakfast product before October 31st they will donate enough for one meal to No Kid Hungry. To double your donation just post a picture of your Smithfield breakfast to Facebook, Twitter or Instagram and tag it #BreakfastPower and they’ll donate a second breakfast to No Kid Hungry! Isn’t that awesome? Now, let’s get cooking. Cut sausage patties into 1/4 pieces and cook until almost done. Remove from skillet and set aside. Add 2 T. butter to skillet and cook onion until tender. Then add hash browns and cook until some potatoes have turned golden brown. Set aside. In a bowl, mix eggs, milk, salt and pepper. 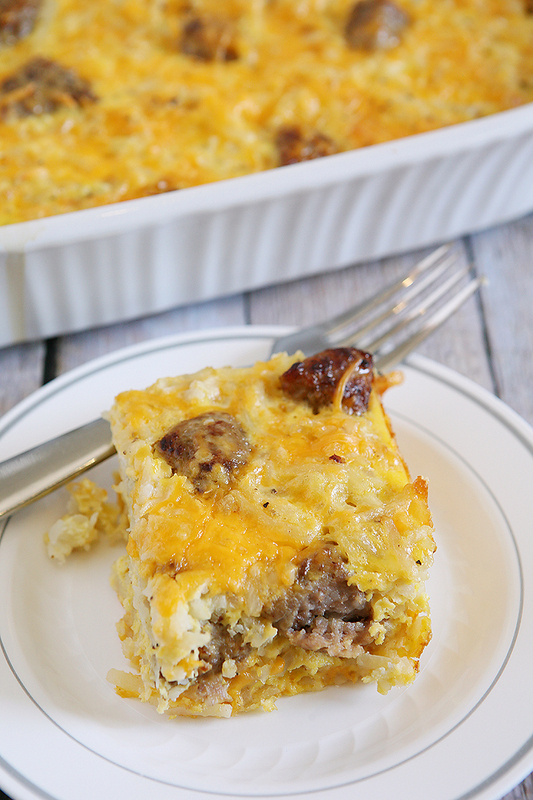 Combine most of cheese with the sausage and hash brown mixture. Spread into a 9 x 13 pan or casserole dish. Add egg mixture and pat down. Sprinkle remaining cheese on top. Cover with foil and bake at 350 degrees for 40 minutes. Remove foil and bake for another 25 minutes. I love that Smithfield Fresh Breakfast Sausage comes so easy to prepare in the already made patties. I also love that it comes in Maple, Bacon and Hometown Original because it’s sure to please everyone. If you aren’t planning to cook them right away, pop them in the freezer until you are. When you’re ready, pull them out. They defrost quickly and you’re on your way to something really yummy. 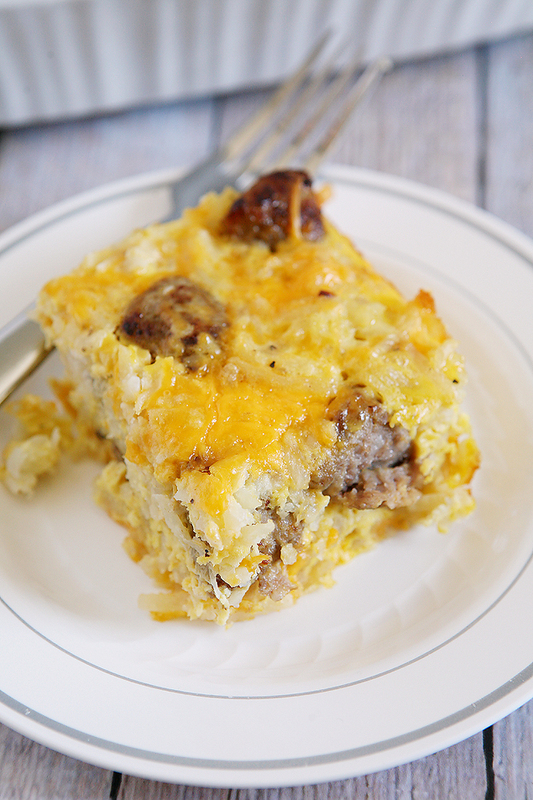 We always have leftovers when we make this casserole but no one complains. It makes some of the best leftovers! A few things we love to add on top are sour cream, ketchup or hot sauce. Enjoy! This looks so YUMMY and easy too, perfect! I can’t wait to give it a go, it is going to be very popular in my household. Thanks for the inspiration. Have you served this room temp or always warm? Wondering how it would travel for a teacher breakfast. Can you prepare it the night before?